A Korean rookie boy group managed by LOTUS Entertainment named MASC (마스크) is coming to Malaysia for their first ever promo tour! 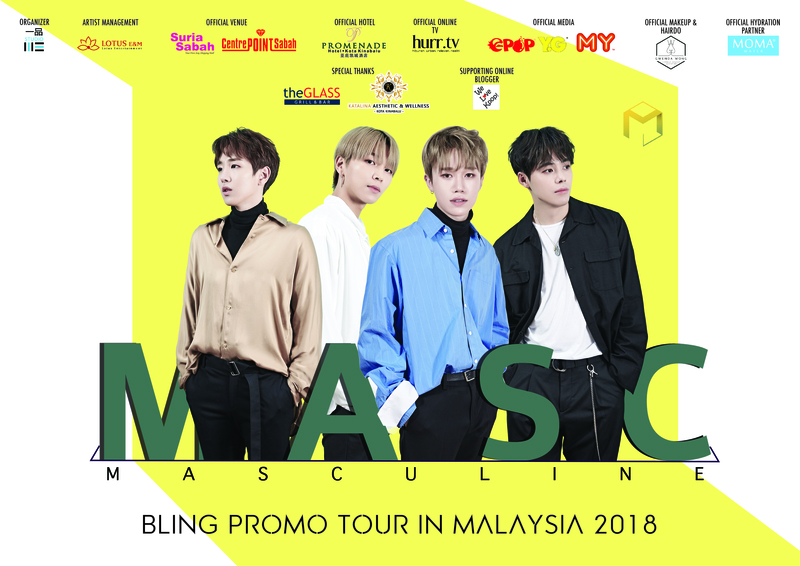 With Malaysia being the first station MASC embark on their promo tour journey, MASC BLING Promo Tour in Malaysia 2018 starts from 22 December 2018 to 31 December 2018, which will last for a duration of ten days. The group name ‘MASC’ refers to the abbreviation for Masculine, which means manliness. It was inspired by the occurrence of MERS (Middle East respiratory syndrome coronavirus) outbreak. The boys decided to name themselves MASC like how a ‘mask’ blocks the invasion of germs. Besides that, they also hope that people will feel invigorated after listen to their music. The boy group formed by the four members including Woosoo, Heejae, Ireah and Moonbong will be performing as well as interacting with their fans through a wide range of activities during showcases. Besides having fans meeting at Kuala Lumpur, MASC will be travelling to Miri, Kota Kinabalu and Ipoh to meet Malaysian fans from different states. With this great opportunity, fans would even have the chance to create more memorable experience with their favorite artists as MASC will be celebrating Christmas Eve and New Year Eve with Malaysian fans! The tour is organized by YiPin Studio, for more updates follow their facebook page.